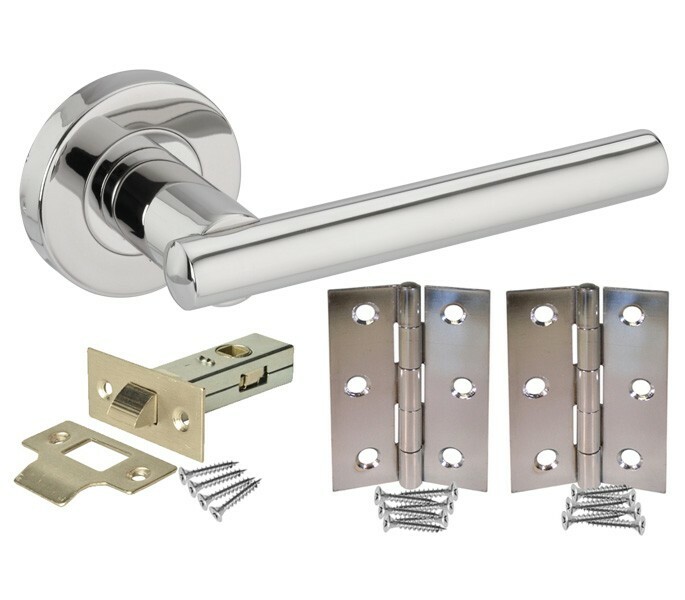 An especially popular choice, this door handle pack includes polished stainless steel door handles with T Bar lever on rose, tubular door latch and door hinges making it a great choice when buying polished stainless steel door handles for your interior doors. 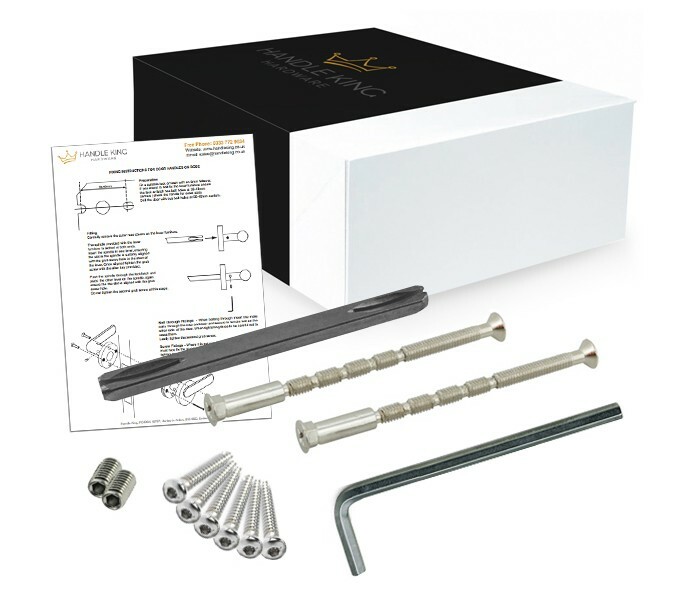 Including everything you need whether hanging new doors or replacing old door furniture this handle pack provides excellent value for money and outstanding quality. Perfect for contemporary homes and properties, the stainless steel door handles included in this pack with matching door furniture boast an everlasting high shine polished finish which will transform your doors giving them a contemporary and chic appearance. 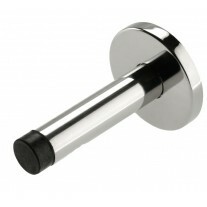 Stainless steel door handle packs include a pair of polished stainless steel door handles with straight T Bar lever on round rose. 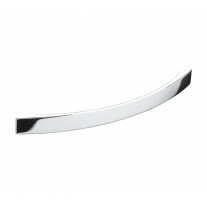 Polished stainless steel these handles simply look stunning in modern homes. Includes fixings and microtight spindle. Overall length 125mm, Rose Diameter 54mm, Rose Thickness 10mm. Matching tubular door latch with 8mm spindle hole (standard UK size) and bolt through fixing hole to suit the handles included in this pack. Includes screw fixing, strike plate and plastic dust socket to be fitted to the door frame. Overall case size 76mm, 57mm backset (distance from edge of the door to the centre of the spindle hole). 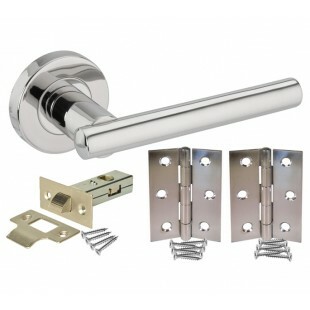 A pair of modern chrome door hinges with screw fixings to suit the other items included with the stainless steel door handle pack. 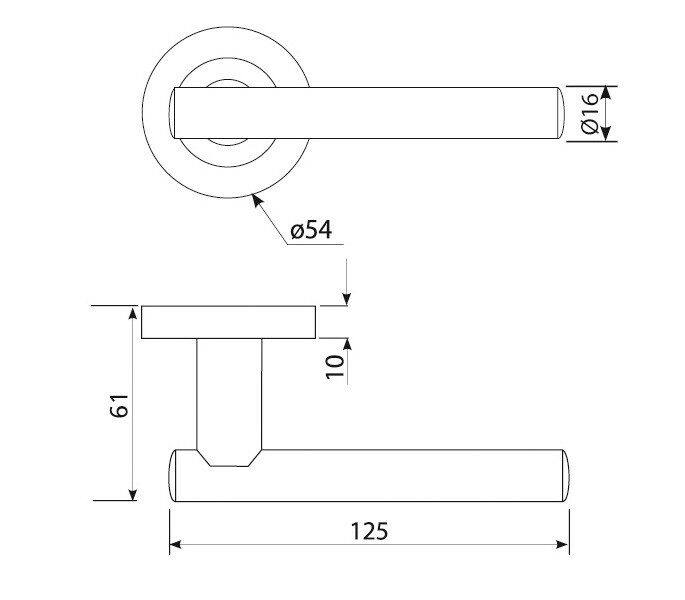 Length 75mm, Width 49mm. 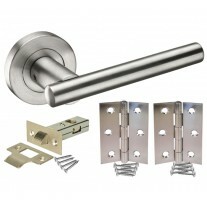 Just select how many stainless steel door handle packs you need and add to cart.